As hot days are changed by rather cold nights Bolivians and tourists go to places where they can enjoy warm and fun nightlife of Bolivia. Though Bolivian nightlife is not as wild as Brazilian, it has its charming places. The best place to spend your night in La-Paz is La Pena clubs which are very cozy places that provide delicious Andas food and drinks which are accompanied by wonderful folk bands. The only thing to remember is that La-Paz is mostly administrative city hence it cannot party too hard, that is why most of the clubs are open from Wednesday till Saturday. There is also another choice for those who stay in the city- to go to hotel bars. Hotel bars are usually opened from 6 pm till 8 pm, Radisson Hotel is probably the best place to try two for one drink and to meet new people. 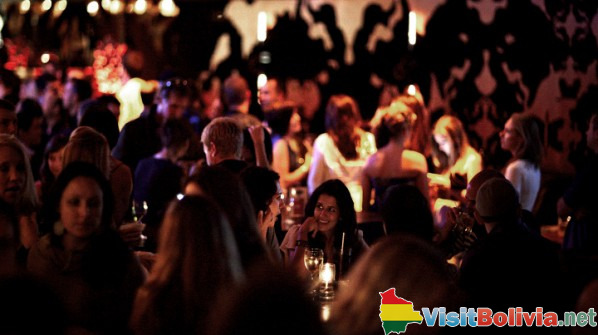 One of the best dance club in La-Paz is PaGoza, here you can enjoy delicious drinks and dance salsa through the night. It is an opposite story with Santa Cruz. Here people live to party. Almost every evening is accompanied with people that are dressed up and are going out for dinner. Bars and nightclubs start to fill at around 11 pm and the partying goes till the morning. One of the best places to go is Equipetrol where you will find almost every kind of entertainment. Equipetrol district is a party place that has different nightclubs, bars and pubs that are always filled with tourists and locals. Avenida Monsenor Rivero mostly specializes in luxurious places like restaurants, lounge bars and cafes. You may also enjoy a cup of coffee in Bar - Alexander Coffe en Santa Cruz De La Sierra as a start and later go to one of the local restaurants to try some national bolivian food. Nightlife in Sucre is very bright and colorful. The biggest number of bars and pubs is situated in Plaza 25 de Mayo. The city is filled with variable restaurants that offer European cuisine and wonderful and spicy Latin food. People usually fill their stomachs before going on bar tours for drinks and then to the nightclubs to dance their nights away. Cochabamba is probably the best city if you are young, full of energy and ready to have an absolute fun. As the city is mostly inhabited by young students the weekends in Cochabamba are usually wild and pretty vibrant. There are 3 main destinations in the city which cater for different crowds of people. For those who is looking for luxury and are willing to spend quite a sum of money there is Boulevard Recoletta. This street is filled with fancy restaurants, cafes and bars that have tasty food and excellent music. Plaza de Septiembre and Calle Espana are filled with various bars, nightclubs and karaoke places that work almost 24 hours. And the 3d destination in Cochabamba is Avenida Bolivian which is also called El Prado. El Prado is a place where most of the Rock& Roll and jazz bars are situated. Obviously, the crowd is informal too. Here you will enjoy different bands that exquisitely combined local music with popular motives of the world famous singers.